The Varied Thrush has undergone recent population declines in Montana and across the Northern Rockies and where timber harvest, insect outbreak, and fire result in a loss of suitable breeding habitat. CommentRecent Intermountain Bird Conservation Region monitoring data for 2010 estimates the statewide population at 390,594 +/- SD of 85,930. Comment139,977 square kilometers based on Natural Heritage Program range maps that appear on the Montana Field Guide. CommentSpecies favors mesic conifer forests which, in the Northern Rockies, have remained relatively stable within +/- 25% of pre European levels. CommentBreeding Bird Survey data has moderate credibility in Montana and shows an insignificant decline of -6.7% per year or 51% decline per decade. For the Northern Rockies as a wholethe data has highest credibility and shows a significant decline of -4.3% per year or 46% decline per decade. Idaho, British Columbia, Alberta, Washington, and Oregon all show declines with high credibility. CommentFire, timber harvest, and insect outbreak related to climate change are the greatest threats to the species due to its reliance on mature mesic conifer forests. CommentLoss of unbroken stands of mature trees takes a long time to recover. CommentFire and beetle kill are drastically changing a large portion (20-60%) of the landscape. CommentNarrow specialist. Relies on mature mesic forest types and riparian forests and often most abundant in areas with more closed canopy. The Varied Thrush is unmistakable with its black and orange plumage and ethereal song. Yet, its shy behavior and tendency to nest in dense mature and old-growth forests have made study of this the breeding biology of this species difficult. In Montana, active Varied Thrush nests have been observed beginning mid- to late-April. Nestlings and fledglings have been observed as early as mid-May. Fledglings from likely second broods observed mid- to late-August (Montana Natural Heritage Program Point Observation Database 2014). The Varied Thrush is a large, brightly colored thrush. Adult male has a burnt-orange breast and throat, gray to gray-blue rump, back, neck, and crown, a black to slate-gray V-shaped breast band, orange-buffy eyebrow and wing bars, and black to slate-gray wing and tail feathers. Female is similar to male but duller overall with brown-olive to brown-gray upperparts, brown wing and tail feathers, and brown to slate-gray breast band. Plumages are similar throughout the year. Immature birds are similar to adults except the head and neck are brown tinged with buff with an indistinct orange eyebrow. Throat and breast feathers are buff instead of orange. The song of this species is distinctive: a long, whistled tone about two seconds in length with a pause of three to 20 seconds between each tone. The song is somewhat ventriloquial. (George 2000). In Montana, the Varied Thrush breeds primarily in mature and old-growth mixed-coniferous forests of western Montana. 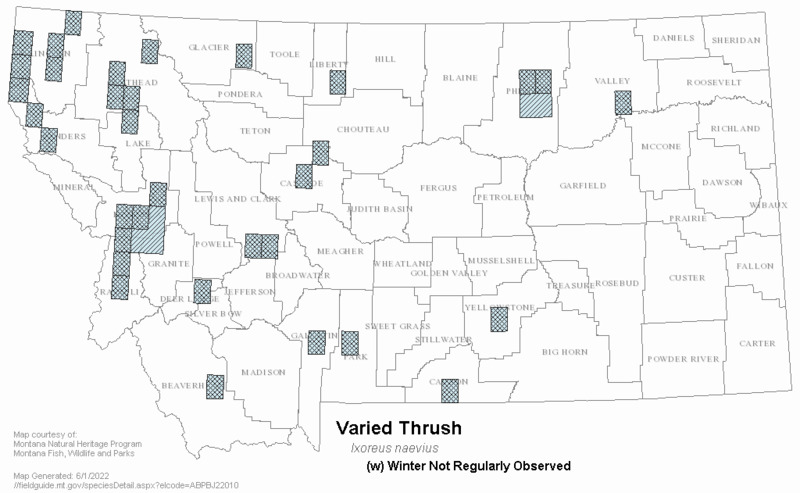 Highest number of observations during the breeding season are in northwestern Montana. This species can travel widely during migration and winter, with observations as far east as Sheridan County (Montana Natural Heritage Program Point Observation Database 2014). The Varied Thrush is a short distance, partial migrant (George 2000). In spring, observations of the species in suburban habitats such as golf courses and backyards into mid-April suggest that arrival on breeding grounds may not occur until mid- to late April. Fall movements likely begin around early September based on multiple observations of the species in unsuitable breeding habitats (Montana Natural Heritage Program Point Observation Database 2014). 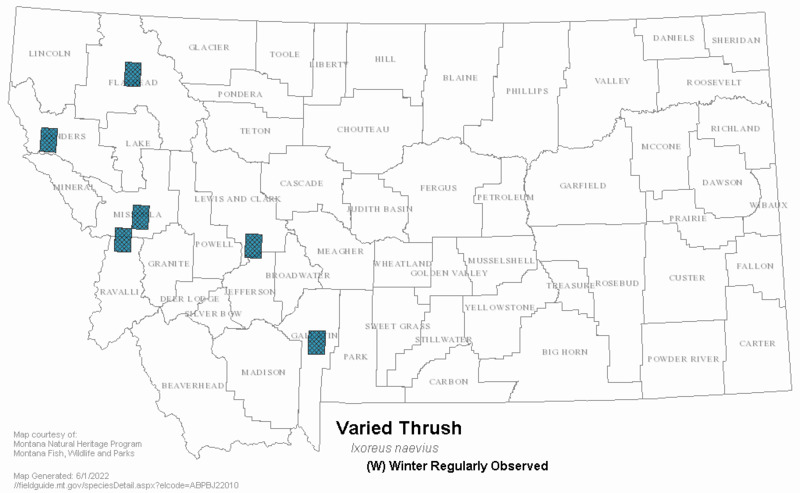 In Montana, the Varied Thrush breeds in mixed-coniferous forests with most observations occurring in western and northwestern Montana (Montana Natural Heritage Program Point Observation Database 2014). Dominant tree species include Douglas-fir and western larch. This species is more abundant in mature and old-growth forest stands than in younger forests (Tobalske et al. 1991). In winter, the Varied Thrush uses a wider variety of habitats, including suburban areas such as bird feeders and areas where fruits and berries are present (George 2000). During the breeding season, the Varied Thrush feeds upon ground-dwelling arthropods. Fruits and berries become important later in the breeding season and during migration. Winter food items are similar but can include mast if available. This species forages primarily on the ground for arthropods, unless foraging for fruits and berries (George 2000). The Varied Thrush is a rare host of the Brown-headed Cowbird, which generally avoids dense forested habitats (George 2000). Nests are often poorly concealed and placed on branches close to the trunk of small conifers, on the ground, in shrubs and vines, and near the ends of branches of large conifers; generally 2-4 meters above ground. Nest is an open cup consisting of three layers: an outer layer of loosely woven twigs, leaves, and bark; a middle layer of rotten wood, moss, and mud; and an inner layer of fine grass, soft leaves, and fine mosses. Eggs are light sky blue and slightly paler than the American Robin with spare marks of small, dark-brown spots. Average clutch size is four eggs. Only female incubates; incubation period lasts about 12 days. Both males and females feed nestlings. Young leave nest 13-15 days after hatching (George 2000). 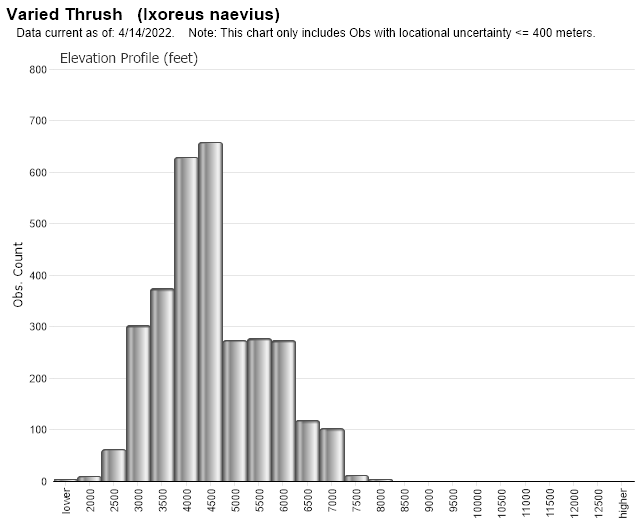 Based on the length of breeding observations, this species likely has two broods (George 2000, Montana Natural Heritage Program Point Observation Database 2014). Logging of mature and old-growth forests reduces the suitability of these habitats for nesting (Tobalske et al. 1991, George 2000). This species requires large, unfragmented patches of suitable habitat for nesting. Additionally, forest management practices that promote even-aged stands may leave large areas unsuitable for nesting (George 2000). Loss of suitable breeding habitat due to forestry practices, insect outbreaks, and wildfires reduce breeding populations. Observations of individuals killed by domestic cats. Dead individuals have also been found after collisions with motor vehicles (Montana Natural Heritage Program Point Observation Database 2014). Collisions with windows also contributes to mortality of the species (George 2000). George, T. L. 2000. Varied Thrush (Ixoreus naevius). In The birds of North America, No. 541 (A. Poole and F. Gill, Eds.). Academy of Natural Sciences of Philadelphia and American Ornithologists’ Union. Mannan, R.W. and E.C. Meslow. 1984. Bird populations and vegetation characteristics in managed and old-growth forests, northeastern Oregon. J. Wildl. Manage. 48(4): 1219-1238. Web Search Engines for Articles on "Varied Thrush"